Molecular biophysics has become a natural field of work for many physicists with biological interests. A huge computational effort is been devoted to the numerical simulation of biomolecules from a microscopic point of view. This approach considers explicitly every atom conforming the biomolecule, and computes numerically their trajectories within a certain force-field. We have already used extensively programs like GROMACS, CHARMM or NAMD to study several problems of biochemical interest. This kind of studies requires large scale computation facilities like a PC cluster or supercomputer. We have used these techniques to research in different problems like: role of hydrogen bonds in protein stability [Campos05], analysis of protein flexibility in the binding of cofactors [Martinez07] and stability of a protein against the “in silico” induced mutations [Cuesta07]. Another interest here is to bridge this microscopic description with the mesoscopic one (see coarse-grained models of DNA and proteins). A numerical method developed recently in our group [Prada10] maps the molecular-dynamics trajectories onto a Conformational Markov Network and extracts from it mesoscopic properties of the simulated system. This tool can be used in order to explore properties of biologically interesting molecules, both from the microscopic and mesoscopic level. 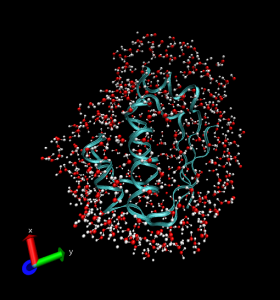 The study of the properties of water in the vicinity of a protein’s surface is another topic of great interest where all-atom simulations is used. The properties of water molecules in this context are different from those of bulk water. This type of special water is commonly known as “biological water”. The structure and properties of biomolecules cannot be understood without considering the surrounding water, which is the most usual biological medium. Indeed, biological water plays a crucial role in controlling the protein’s three-dimensional structure and dynamics and therefore its biological functionallity. 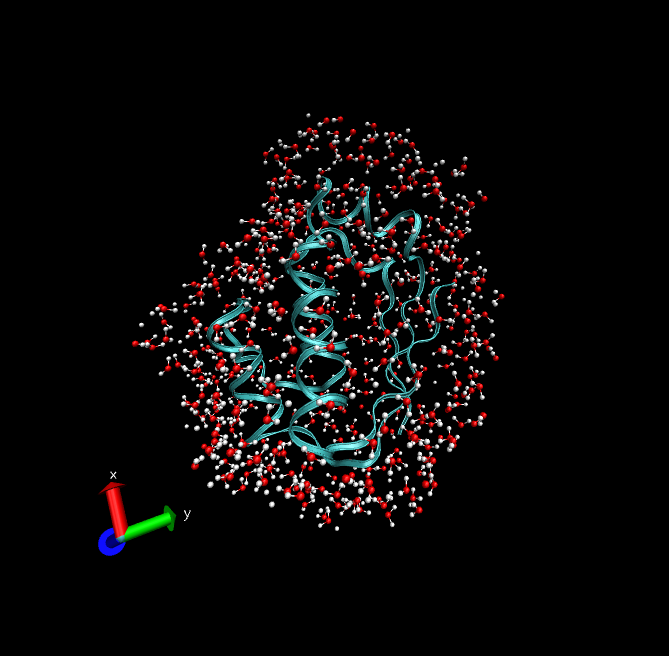 “All-atom” computer simulations analysis can help in answering many detailed questions regarding the time scale and the nature of the dynamics near a protein surface [Morón12]. Such studies are aimed at understanding the coupling between the protein and solvent dynamics and its likely influence on biological processes. [Campos05]L. A. Campos, S. Cuesta-López, J. López-Llano, F. Falo, J. Sancho.A double-deletion method to quantifying incremental binding energies in proteins from experiment. Example of a destabilizing surface hydrogen bond. Biophysical Journal 88 1311-1321(2005). [Martinez07]M. Martínez-Júlvez, N. Cremades, M. Bueno, I. Pérez-Dorado, C. Maya, S. Cuesta-López, D. Prada, F. Falo, J. A. Hermoso, Javier Sancho.Common conformational changes in flavodoxins induced by FMN and anion binding: The structure of Helicobacter pylori apoflavodoxin.Proteins: Structure, Function, and Bioinformatics. 69 581-594 (2007). [Moron12] M. C. Morón. Water dynamics on the surface of the protein Barnstar. Physical Chemistry Chemical Physics 2012 (in press).